If you are a part of our private eCommerce forum or have been thinking about joining up, then you may have wondered just how we review and accept new members. If you’ve ever wanted to emulate the copy from our site, you’ll meet the voice behind the content, our Community Manager Laura Serino. 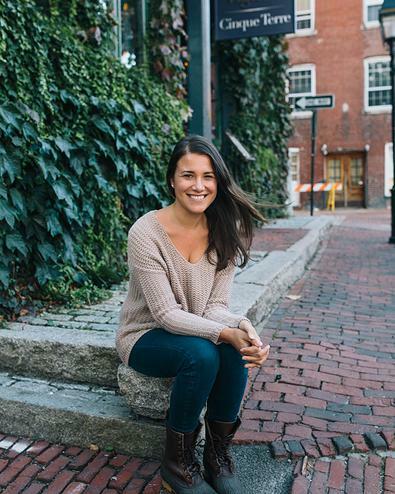 As most of you know, about a year ago we had a new face join the team – our Community and Content Manager, Laura Serino. Laura has become an incredibly valuable part of the team, with a broad range of responsibilities including screening all new applicants for the forum. Laura shares some of her tips for writing fantastic eCommerce product copy and how she keeps the forum humming every day. Andrew: Today on the show, I’ve got our very own Laura Serino who is the content and community manager here at eCommerce Fuel. I wanted to bring her on for a bunch of reasons. I wanted to introduce you to her if you’re not familiar with her, give you a sense of what she does here at eCommerce Fuel. She wears a ton of hats, talk about the forum a little bit, the private form, some of the changes we’ve made, some of the things that she does on a daily basis to keep it humming and to add value to members and also talk about our upcoming eCommerce Fuel live event in Nashville for store owners. So we cover a bunch of different stuff in today’s discussion, which we’re going to get to in just a minute. But first, I’d love to do a first sale shout out and this one’s going out to Rel, the founder of silverliningbespoke.com who writes in, “Hi Andrew! Always learn a ton from the podcast and have been listening since before starting the business.” Thank you. “I’ve recently launched silverliningbespoke.com where we make custom lined outerwear and accessories to highlight that it’s what’s inside that counts and we give a percentage of profits to arts education programs to help foster creativity and innovation. It’s been an exciting launch and I’d love to get a first sale shout out. We just sold a bunch of awesome artisan print jackets thanks to a press writeup in the San Francisco Chronicle. Thanks so much!” Rel, first off, congratulations on the first huge infusion of sales and secondly, beautiful job with your website. I know you’re getting your first sales. It doesn’t look like that though. You’ve got an entire custom line of jackets, of course. I’m not really a fashionista or fashionisto but man, I even wanted one of those jackets. They’re beautiful. The photography’s brilliant, the site layout looks really sharp. You designed everything from scratch. It looks like you’ve been doing this for years so I’m sure that the momentum will continue to be in your favor so congratulations on launching a killer brand and keep it up! Let’s go ahead and get into today’s discussion with Laura Serino, the content and community manager here at eCommerce. Laura, welcome to the podcast. It’s crazy you’ve been here for over a year and this is the first time you’re coming on. That’s wild! Laura: It is wild to be on because I feel like I’m constantly transcribing the podcast. I’m excited I get to be on one. Andrew: Transcribe one of your own podcasts. Yeah, you came on more than a year ago in June of 2014 and within less than there months of joining, you’d organized and pretty much pulled off our first event, ECF Live. It’s crazy how quickly it’s gone. Laura: During my wedding month, too, don’t forget! Andrew: What kind of terrible leader scheduled that for you? Laura: I got totally tricked into it but it all worked out. The wedding and ECF Live so that was good. Andrew: It did. It worked out beautifully. So for people who don’t know you very well, maybe not in the forum right now, what’s your background? What did you do before you came to be part of the team here? Laura: Well, I started out writing stuff for magazines right out of college. I had gone to school in New York City and I lived there for almost five years before deciding to move to Maine and obviously, the magazine industry isn’t exactly booming in Maine and actually my former boss suggested I looked into copy writing since she thought maybe I’d be good at it. So prior to joining you, I was actually at L.L. Bean as a copywriter and I kind of wrote for all different departments and worked on everything from email campaigns to print and catalog campaigns, landing pages, product copy, kind of ran the gamut so now I’m here. Laura: Yeah, it’s worked out well. They served me well for the new gig for sure. Andrew: So as a copy writer, we’re going to get into kind of more about the forum here in a couple of minutes, quickly, what are your two or three of your maybe quick and dirty rapid fire tips on how to write amazing eCommerce product copy? Laura: Okay, so I always write in bullets first so whatever the product is, you kind of should do a stream of consciousness about it – what the product does, who uses it, great things about it. You’ll kind of end up with a word jumble and I think a theme always inevitably emerges and that’s often a really good starting point for copy. And then I also really like the long form exercise and that’s especially good when you have only a few products to sell and you really want to nail them and you take the product and you try and tell a story about it. So it’s not even necessarily copy you’ll end up using in the long term, but it kind of gets your gears in motion for thinking about how to write about it in a really engaging way. So I once had to write an entire long form story about a gift card and we ended up pulling a ton of great headlines from it and I think one was about how it’s the gift no one will need to return the day after Christmas or something like that but it’s just a really good practice. And then I just always used to read awesome copy first too. Any time I’m about to write, I will read stuff from brands and sites that I really like. Andrew: And what are those? What are some of your favorite examples of really good copy? Laura: Well, when I was at Beans especially, I read a lot from Filson, J. Crew, Bonobos because they just nailed branding over time and so I always looked to kind of brands like that, especially for emails. There were three that I always looked at. Andrew: Do you read the copy on twirlygirl.com? Is that the website? Andrew: Yeah, the member just joined the forum this week and it’s really good. Laura: So impressive! Knows it’s customer. Really fun and lighthearted. Yeah, that’s a really great example of the site a does it well. Andrew: Kind of let people know, what else do you do behind the scenes at eCommerce Fuel to make it tick because you do a ton of stuff on a weekly basis. Laura: Well, thanks! Well, everyday I’m in the forum, obviously, reading through discussions, chatting with forum members, kind of collecting awesome comments and threads for the newsletter wrap-up that I send out every week. And then I’m also vetting every new applicant that comes through so whoever wants to join the forum, I’ll eventually approve or deny them and onboard each one of them to help them get acclimated as a new member. I also work on the blog and kind of helping out with the podcasts transcriptions now and content planning and email marketing for Right Channel and right now, I’m planning a little event called eCommerce Fuel Live so a little busier now than I normally would be. Andrew: Yeah, a ton of stuff. And I want to talk about ECF Live to wrap things up because it’s going to be fun to kind of give people a sneak peak of what’s coming up in October. Andrew: So let’s dive into the forum a little bit. So you’re kind of of official role is kind of like what you alluded to, content and community manager so you kind of have your feet in both of those pools. I think I used the wrong expression there but you get what I mean. So you mentioned screening members. So the forum, of course, there’s requirements to make sure it’s a vetted group of people. You screen all of the new people that come in. What are you looking for in applicants and how do you screen them? Like give us a sense on how you creep on people who apply for the forums? Laura: Well, people are going to be like, “Laura’s basically a stalker.” Every application that comes in, I review everything that’s there so I look at their website. I’ll look them up on LinkedIn, kind of check out their social media presence and really, at this point, I’ve reviewed so many that I can kind of get a good feeling pretty quickly about whether they kind of make sense as a fit for the forum. Lots of applicants actually find us through the podcast or blog, which is great because I think they already know you, Andrew, and they’re familiar with the brand so I don’t know. It’s really hard though to review someone just through an application but at this point, I feel like I can give it a glance to an extent and know that, yes, they’ll be a good fit. But if there are any doubts about applications, we’ll ask for more information sometimes or revenue proof just to ensure that they’re really the right caliber for the forum. Andrew: Yeah, so people ask that too, the minimum requirements that you need to be having at least a six figure store to apply as a store owner. People ask, “How do you know that? Do you check for revenue proof?” So what do you . . . when you’re looking at that, do you always ask for revenue proof from forum members that are applying? Laura: I don’t always ask. Sometimes you could just tell based on the site and they have a huge 12,000 fans on Facebook. They say that they make over $2 million a year. If they do and I see the site and it’s looking really good, I tend to believe them. I tend not to be a total naysayer. But then there are some sites that maybe they’ve only been around a little while and you do like to kind of just make sure that they’re at the level that a lot of our forum members are already at. Andrew: So another thing that people ask kind of frequently about is well, what happens when you apply in terms of how does the application process work? What happens when you come in? If someone’s thinking about applying, can you walk them through that first week from when they hit the submit button the application to what happens that first seven days when they come into the community? Laura: Yeah, so as soon as someone hits the submit button, I will probably see it within 24 hours. I’ll see it pretty quickly and kind of review it and then if they’re approved, I’ll let Kay know who’s one of our VA’s and super crucial to the process. And she kind of handles adding them to the forum and once they’re all the back-end stuff they’re added in, she lets me know and I send them a welcome email and I try to let everyone know that these aren’t automated emails. I really do take the time to look at who they are and where they live and what their businesses are like as I introduce myself to them. So once I do that, new members also get introductions set up, usually to an established member and then to a member that maybe I think they’d hit it off with so I’ll look for someone maybe in a similar niche or maybe someone that lives in their same town so I’ll kind of try and use my knowledge of the members to pair them up with people that will help maybe draw them into the community right away. And then they also get an email series that first week that kind of helps them acclimate, shows them threads to check out, the discounts they get as a member, other highlights about things we offer, like our Mastermind Groups. And then after a month, I’ll check in with them each personally again just to make sure things are going well and to see if myself or the forum could be offering anything more for them. Andrew: And what aspect, you mentioned a couple of them, some of the Masterminds, the service provider directory – I don’t know if you mentioned that but that’s something we just rolled out, is there one thing that you hear from people when checking in for members that they find the most valuable or resource that is kind of what you hear time and time again is what they get the most out of in terms of being a member? Laura: I think hands down, everyone is surprised at the caliber definitely inside and I’ve heard from a lot of people that join the forum that maybe they’re a store owner or maybe they only have one other VA or maybe they’re really running their business by themselves from a laptop and I think they sometimes feel like they’re in a little bit of a bubble and I think the forum kind of acts as those coworkers that they don’t have that they can bounce problems off of or ideas off of. There’s actually a thread in the forum right now about work distractions and I thought it was really funny that a lot of people said that the forum is the main distraction in their day but I kind of loved that. Andrew: Oh man! I don’t even want to know how many times I type in “for,” hit auto-complete and go to the forum everyday. It’s terrible. Speaking of quality people, one of your jobs is to make sure that everyone who’s in there is giving and taking equally, that people aren’t just coming in and posting thread after thread of questions without giving any value back and from time to time, we get people that we have to remove because they’re just not a good fit. And I’ve kind of dubbed you the hitman because before you came on board, I had the very unsavory rule of having go in and write these emails to people and it’s never fun when you have to pull people out of a community. Laura: Yeah, thanks for that, by the way. Andrew: Oh yeah, you’ve really embraced this role as kind of the hitman or woman of the forum and how much have you loved that the last year? Laura: I’m embarrassed to admit that I do not mind it at all. No, when it comes down to keeping the forum an awesome place, we’ve got so many members that offer such high value adds that when we have a member that’s constantly asking and not giving back, it’s really easy to give them a warning and then I don’t feel so bad if. . . some behavior is just like, okay, I didn’t get it and they turn out to be awesome members. And then sometimes people just are not going to be a good fit so I don’t mind laying down the hammer and letting them know that it’s not going to work out right now and kicking someone out. Andrew: I love it. We’re going to have to get you a badge or some kind of like cartoon character profile for Twitter. Laura: Oh yeah, I need something. Andrew: We made some big changes, well maybe a couple months ago where traditionally we had allowed people who had SaaS businesses or software businesses in the eCommerce space to come in, or even consultants could be members and we kind of changed that around back in April or May to really only allow store owners and people working for stores on a forward going basis and we actually ended up removing, this was another hard decision but we ended up limiting the access and removing people who had platforms like shopping carts or SaaS businesses that were eCommerce related. So I’d love to hear your take on that and we’ve talked a lot about it but what was it that you heard from members that kind of led us internally to make that decision and do you think it’s been a good change? Laura: I think it’s been a great change. There are a lot of instances where forum members felt they couldn’t be as candid as they wanted to be in the forum and risk providers that they wanted to talk about reading what they had to say and occasionally when they did post about it, often times someone that works for that platform or business weighed in kind of on the defense and even if they didn’t weigh in on the defense, they were still weighing in and that was, I think a hard situation for members that really wanted an opinion that wasn’t biased so and then there were the rare occasions where certain providers or platform members maybe got a little too pitchy and the forum is meant to be a community and not something where you feel like you’re going to get a sales pitch when you’re in there. And I have to say, there were few and far between that did that but it was becoming more and more frequent and I think that – it was a good decision to do and we did grandfather in some really key people that might be service providers but they’ve been top members for a long time and have never actually had that kind of way about them in the forum where they’re pitching to people and they’ve just been huge value add so I think good change. It was a hard decision to make but I think we made the right choice. Andrew: Yeah, I’ve heard that from a lot of people too and it’s really hard when you make a blanket decision like that because you do, for people to feel comfortable, you need to be able to say, “hey – there are no service providers or no platform providers.” And it was tough because a lot of people that were great, people would really, like you said, they never pitched, it was tough because we had to limit their access to the community and that was hard to do but I think it was the best thing to do in the long term interestof the group. It was a tough decision nonetheless. So last question on the forum here, Laura, what’s the most entertaining thread from the past year that you’ve seen that you liked? Laura: Oh God! I loved the prickly customer rants, those crack me up. So I think there was one, one of the forum members wrote about how he responded to a customer review on Amazon versus how he wished he responded and it was freaking hilarious! We have some really funny forum members so I think that discussion spawned another vent session thread about ornery customers and every so often, it takes off again and people chime in with kind of funny/frustrating stories and I love those because they remind me to be calm any time I get the wrong order shipped to my house. I think about the guy on the other end of that. I’m like, I am not going to complain because I could end up in a forum one day, someone complaining about me. Andrew: It’s so funny when you do everything against your nature when something gets botched and your first inclination is to go ballistic, especially if the company hashed it really well, that’s like the worst thing you can do to get the desired outcome you want because it immediately puts whoever is in the business on the defensive and they hate you and yeah. . . it’s the whole catch more flies with honey kind of thing that actually works. And surprise surprise, it applies to store owners. Laura: I’m so glad the forum exists because they can just complain to us instead of their customers. It’s great! Andrew: Store owner therapy daily in the forums. Andrew: So I want to talk quickly about ECF Live. So once again, you’re largely responsible for the event. It’s going to be October 7 through the 9th. Tickets are going sale publicly for qualifying people who aren’t forum members as long as they either work for an eCommerce company or have a store that’s doing six figures or above annually and we’re recording this right before we release tickets publicly. They’re about two thirds, close to two thirds sold out now. Hopefully, we’ll have a few left when this airs. Any sneak peaks into what to expect this year in Nashville? Laura: Oh, it’s going to be really good! Well, we’ve got a great kickoff party right out at the Gaylord Opryland, which this, I cannot wait to check this place out in Nashville. It’s got waterfalls inside the hotel so I’m pretty stoked about that. Andrew: It’s like a whole river inside the hotel. Laura: Yeah, it looks crazy so I’m excited about that we’ll definitely have a night on the town in downtown Nashville and hopefully, listen to some live music since we are in Nashville, after all. But yeah, it’s going to be great because right now, I think we’ve got a mix of long time and brand new members coming so I don’t know, Andrew, I think maybe we’ll be sold out by the time this goes live, this podcast. But there’s always ECF Live 2016. Andrew: Hopefully we’ve got a few tickets left when it does air and the closing part will be fun too. We’re kind of doing a real class act kind of Nashville honky tonk for our closer. Laura: Yes, it’s going to be really good. It’s going to be in a great space downtown, music, drinks. It’s going to be great! Andrew: Yeah, we may have to request only Budweiser available for consumption given that it is Nashville. Laura: Only Bud heavy, not Bud Light. Andrew: Exactly! If you’re only a Bud Light drinker, you may not want to come this year. Well, Laura, it’s awesome! Thanks for coming on. Appreciate all the work you do. Like I mentioned at the top, you just do so much work to keep the community and the blog and everything at eCommerce Fuel running smoothly behind the scenes and it’s been great having you on for a year and looking forward to the forum growing this year and eCommerce Fuel Live in October so thanks so much for everything you’re doing. Laura: Thank you, Andrew. It’s totally been my pleasure. Andrew:And if anyone wants to check out those tickets for ECF Live, you can check out the show notes for this episode or just got to ecommercefuel.com/live and if there’s tickets available, you can check them out there. Same thing for the forum, if you’re interested in the forum, ecommercefuel.com/forum and you can apply right there. All right, Laura, thanks a lot. We’ll talk to you soon. Andrew: That’s going to do it for this week. If you enjoyed the episode, make sure to check out the eCommerce Fuel private forum, a vetted community exclusively for six and seven figure store owners. With over 600 experienced members and thousands of monthly comments, it’s the best place online to connect with and learn from other successful store owners to help you grow your business. 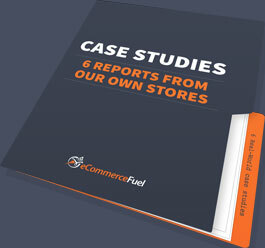 To learn more and apply, visit ecommercefuel.com/forum. Thanks so much for listening and I’m looking forward to seeing you again next Friday. Love the copywriting suggestions by Laura. Bonobos and AYR both know their customer quite well and their copy reflects that. Another company I would add, and off the beaten path a bit, is old school J. Peterman catalogs. You can subscribe and get new catalogs quite frequently. The story-telling aspect for their products is unlike you’ve ever seen.